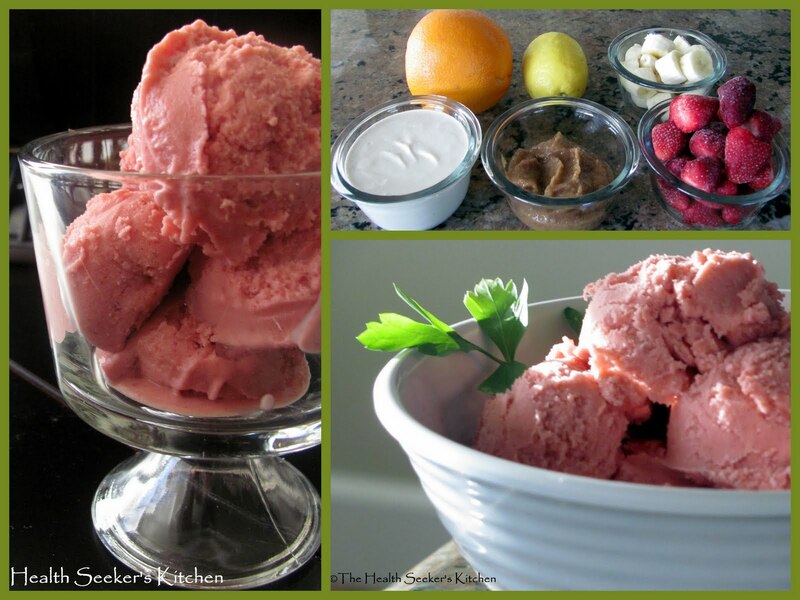 I created this delicious Non-Dairy Strawberry Banana Ice Cream to be packed with extra flavor! This yummy recipe includes cashew cream, dates, juice of 1 orange and 2 lemons, 1 cup sliced bananas and 1 1/2 cups of frozen strawberries. You can feel good about eating this as a delicious dessert, or if you want you can even eat it for breakfast! 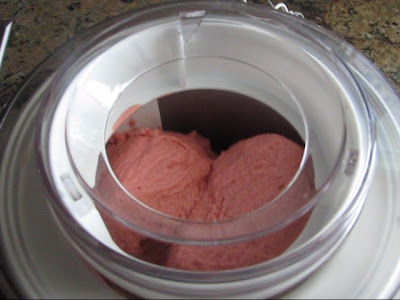 I used my Cuisinart Ice Cream Freezer, but you can also just put the mixture into a container and freeze, or pour into popsicle molds for the kids. Your family will love this one. 14 regular pitted dates (soak in water until soft and reserve 1/4 c. water) If using medjool dates, use less dates. Drain soak water and place cashews in blender. Add 1/2 cup water and blend untill smooth. Stephanie-You will love this recipe. It is sooo....delicious and fresh tasting! You know, I never actually thought to just pour ice cream into molds. That seems a lot easier than putting it in a big container and scraping it occasionally so it doesn't freeze into one big chunk. What a delicious looking recipe. I can't wait for bananas in Australia to come back down to a sane price (they are AUD$14/kg at the mo!). Do you have any thoughts or suggestions on what I might use in place of the cashew cream? I'm after something nut free, perhaps tahini (I totally understand if this isn't doable). I really think it's a good thing that I don't have an ice cream maker. Foodfued- Yes, popsicle molds work perfectly!! Nina- I will work on this recipe and create a nut free version for you:) Wow, bananas are so expensive in Australia. I think that is just under $7.00 a pound. That just looks so delicious and fresh and I think I need some NOW!!! lol! good job! We made this yesterday and it was delicious. Everyone enjoyed it. A Gracious Plenty: I am so glad you made my ice cream and that everyone enjoyed it. Thank you for your comment. This looks like some great tasting raw vegan ice cream. Vegan food has come a long way. Also this is a great time for you to be in health and nutrition to see history being made. In the last 3 years 6 MDs have written 6 books about vitamin D-- the sunshine vitamin or hormone. In 2007 Time magazine chose it as one of 10 top medical breakthroughs of the year. In December 2010 the RDA of vitamin D was tripled. Moores Cancer Center is proposing that cancer is a vitamin D deficiency. The doctor of public health there and professor of medicine at U of CA, Cedric Garland, says that enough vitamin D (lifeguard levels) will virtually eradicate breast cancer. I have a post on my blog about it with links to Harvard, Dr Oz and Christiane Northrup M.D. talking about vitamin D preventing breast cancer.